RAYMOND WEIL adds a centrepiece to its maestro collection, and remains true to the parameters of classic, timeless and elegant watchmaking. 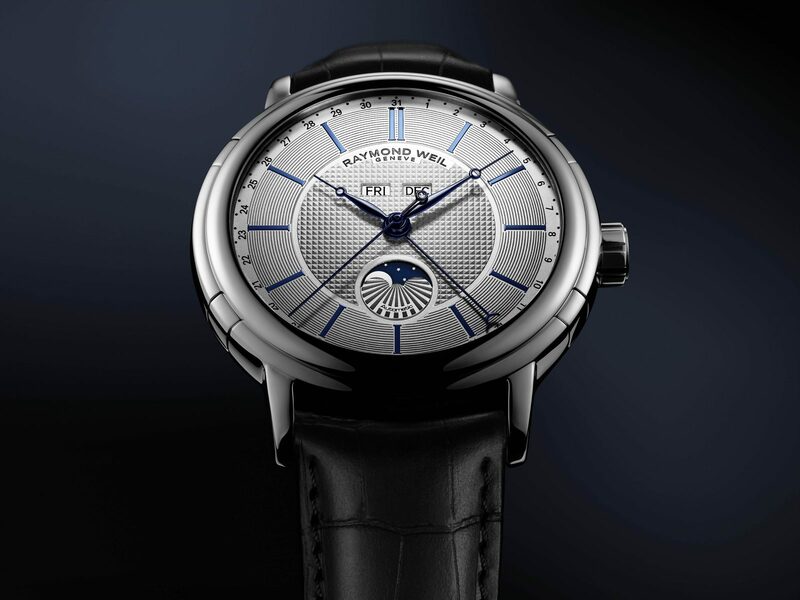 The maestro collection symbolises the family Company’s deep attachment to its watchmaking roots and also celebrates the creative mastery of every artist at the height of his career. With its latest arrival, RAYMOND WEIL pays homage to its longstanding source of inspiration – music. Since time immemorial, the phases of the moon have helped man to get his temporal bearings, they are at the origin of the week and the month. 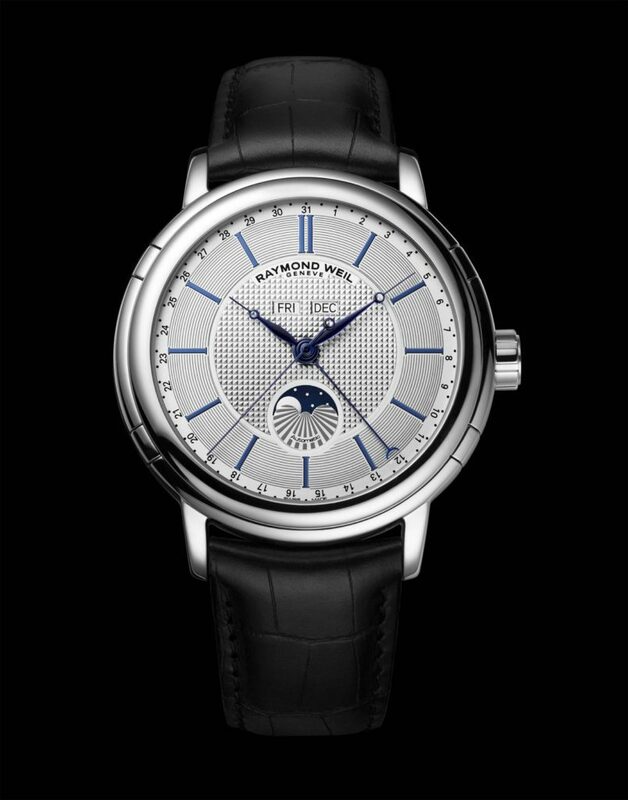 With this unique complication in its collection, RAYMOND WEIL offers watch enthusiasts an exceptional model. Housed in a 44mm steel case, an automatic winding mechanical movement regulates the beat of this maestro Phase de Lune, providing it with a power reserve of 38 hours. Level with the case rim, and almost imperceptible, four correctors enable the adjustment of the months at 2 o’clock, the round date at 4 o’clock, the moon phases at 8 o’clock and the days of the week in the window at 10 o’clock. All these complications are orchestrated by a ballet of blued hands that sweep over a silver dial; one of these, delicately tipped with a crescent moon, points to the circular date. Watchmaking classicism prevails with the alligator style leather strap dressed in black and secured by a steel Ardillon buckle. 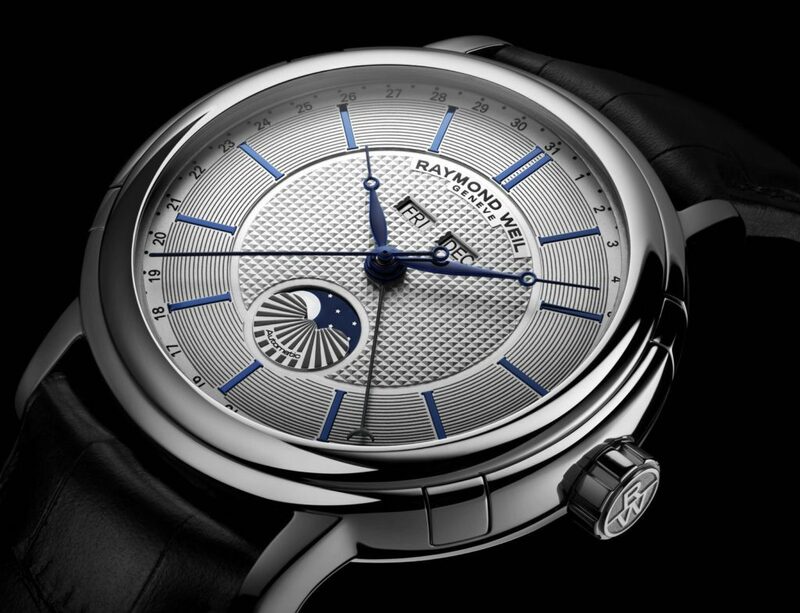 RAYMOND WEIL has composed a musical score without a hitch – an elegant jewel with pure and precise lines, demonstrating all its watchmaking know-how, together with the implacable constancy of its mastery of timeless design. The music-loving watchmaker provides the beat of the tempo for the skilfully orchestrated sound of the notes of refinement.